Canine and feline Seborrhea is a skin condition that can either be inherited (primary) or occur as a result of another medical issue (secondary), both of which can be treated with cleansers like DOUXO Seborrhea Shampoo. While relatively rare in both cats and dogs, primary seborrhea is common in Persian and Himalayan cats. Dog breeds that are most commonly known for suffering from Canine Seborrhea are Shar-Peis, West Highland, White Terriers (Westies), Doberman Pinschers, American Cocker Spaniels, German Shepherds, English Springer Spaniels, Golden Retrievers, Basset Hounds, Labrador Retrievers, Irish Setters, and Dachshunds. Does my pet have a seborrheic skin condition? Your pet may be suffering from seborrhea dermatitis if you notice they have dry, flaky skin (dandruff), greasy skin and hair that usually emits a foul smell, inflamed skin, and scratching. If your pet scratches the affected areas too much, it may lead to bleeding, crusting, or hair loss. If you notice any of these symptoms, take your pet in to see your veterinarian. If it’s a secondary condition, you may be able to rid your pet of seborrhea altogether by taking care of the medical condition that is causing it. If it’s primary seborrhea, you can manage the symptoms with shampoos and sprays. DOUXO Seborrhea Shampoo is a soap-free formulated shampoo meant to treat symptoms of all types of seborrhea skin conditions in dogs and cats. It cleans greasy, dry, flaky, and scaly skin while moisturizing and soothing the skin. The main ingredient, phytosphingosine, contains moisturizing and soothing agents that help restore the skin barrier, which aids in bringing the skin back to normal. 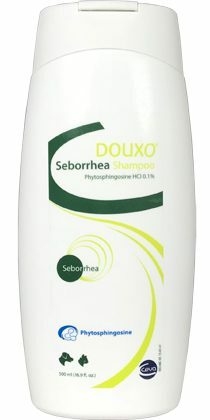 DOUXO Seborrhea Shampoo also helps the skin maintain normal bacterial and yeast flora. DOUXO Seborrhea Shampoo is an over-the-counter product, available in a 16.9 oz bottle. It can also be used alongside DOUXO Seborrhea Micro-Emulsion Spray. Talk to your vet and see if DOUXO Seborrhea Shampoo is right for your dog. 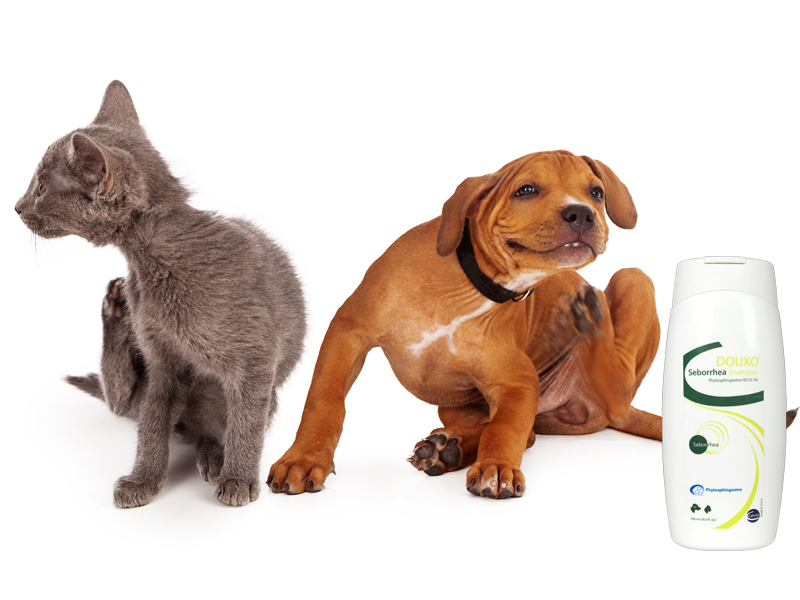 Win FREE DOUXO Seborrhea Shampoo for Dogs and Cats! Does your dog or cat suffer from a seborrheic skin condition? Restore your pet’s skin with DOUXO Seborrhea Shampoo! Just leave a comment below and you could win FREE bottle of DOUXO Seborrhea Shampoo from 1800PetMeds! One winner will be chosen at random on Thursday, July 12, 2018, so everyone who participates has a chance to win! (Limited to residents of the U.S.) Good luck! Congrats to the drawing winner, Michelle M. We’ll send you an email about claiming your prize! Although my dog is mainly inside the majority of the day, Florida’s weather and environment are rough on any dog’s skin. I have used many products to keep my pup’s skin healthy. I would love to try this product! Looking for a magic shampoo! I think my 2 cats are suffering from this. They are indoor cats and scratching and licking themselves constantly. My dog is 50% German shepherd and 50% saint Bernard. She’s about 2 years old and has been struggling with this condition. She lost the back end fur on half her body. She itches non stop. I switched her diet, I added fish oil treats, I tried other shampoos that claimed they would fix the problem. They have stopped it from getting worse, but are not curing my poor girls problems. I would love to win this to see if it could permenetly cure my fur daughter. My two dogs have severe allergies resulting in itchy, flaky skin. I’ve tried many products with minimal results. My dog has had seborrhic dandruff in the past. I have it myself. This sounds perfect for my little Maui! She is itching and scratching all the time and has sensitive skin so finding a shampoo that works for her is tough but this sounds perfect! I own American Cocker Spaniels and the severity of the skin problems make them suffer a great deal. I’ve used some of the best natural and organic products on the market trying to cure my pets, hopefully this product will help us. My cats have the dryest skin! This would be a huge help, thanks for the chance! My chihuahua is 7 months, he scratches often and chews his paws. I tried herbal shampoo and oatmeal shampoo and so far nothing. My dog has real dry skin. Between licking and scratching he is always doing something! Would love to try this shampoo for my Labrador retriever. He is so itchy and is missing some hair. My JRT scratches and bites her feet a lot. I have tried a tea tree oil shampoo and cannot tell much of a difference. I would love to see if this shampoo would help. I would love to try your product to see if finally it would make his skin feel better and make this poor guy more comfortable. My babies are always scratching and vet said it is due to allergies. This could be the extra help they needed! Petey is constantly scratching from fleas and overuse of flea topicals. I think we have the fleas figured out, but can’t seem to get rid of itchy irritated skin. Aloe vera shampoo has not helped, maybe this product will. My dog, Boone, has been suffering for years. I haven’t been able to find anything that works! Would love to win, with the hope that it will work for him! I have a indoor cat I think she might have this. My German Shepherd died in March and might have got it from her . My cat is constantly scratching. My doxin has this condition in a severe state. He is almost naked. I really feel bad for him. He has testical cancer. This is a side affect. I dont have the 55,000 to make him better. He is 12 years old. Just want some of this to make him a little more comfortable. Can buy this shampoo at about 50.00. I would like to win for him. This would be good for my Molly. She’s a yellow lab that just turned 2. I live in the woods. All of a sudden flea issues. She had a Seresto collar on too. I am at a loss. I have gave her a Capstar. Got rid of all the fleas. Now I am dealing with where the flea dirt was. Itchy flaky sore spots on her. I would love to win this for her as it would be a big help as I am a senior on a fixed income. Either way, I will take care of her. Winning this would sure help for her. My dog Sandy gets itchy dry skin (she’s a Beagle-Lab mix).